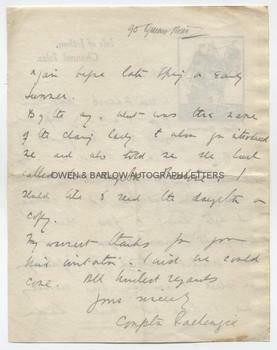 COMPTON MACKENZIE Autograph Letter Signed. ALS. 2pp. Isle of Jethou, Channel Isles. February 23rd, no year [circa.1915]. To [Arthur St John] Adcock. "How kind of you to ask my wife and myself to be the guests of the Bookman Circle on March 2nd. Alas, we must regretfully decline the pleasure. I was in town at the end of January, and after keeping a few speaking engagements was seized of a most violent attack of influenza, from which I am only now recovering, and I dare not face London again before late Spring or early Summer. By the way, what was the name of the charming lady to whom you introduced me and also told me she had called her daughter Pauline, I should like to send the daughter a copy. My warmest thanks for your kind invitation. I wish we could come. All kindest regards, Yours sincerely, Compton Mackenzie." 4to. 20 x 16 cms (8 x 6.25 inches). Old glue stain to left edge, else fine. 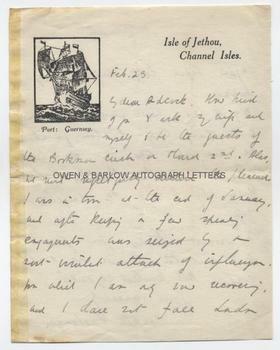 An early Compton Mackenzie letter to St John Adcock, the writer, poet and editor of the influential literary periodical 'The Bookman'. The "charming lady" who had named her daughter Pauline	had presumably done so after the name of the heroine in Mackenzie's 'Guy and Pauline', which was published in 1915 as a sequel to his earlier novel 'Sinister Street' (1914). Although Compton Mackenzie is perhaps better known today for the novels 'Whisky Galore' and 'Monarch of the Glen', his above named earlier novels where widely read, well received and were a literary influence on F. Scott Fitzgerald and George Orwell. Henry James called 'Sinister Street' the most remarkable novel written by a young author in his lifetime.